The town of Mazara del Vallo has been very important throughout the history of Sicily - it began life as an important supply centre for Selinunte, and since antiquity it has been a safe port for boats. Given its strategic geographical position it was conquered many times by the Phoenicians, Carthaginians, Romans, Arabs, Normans and Swabians, each of whom left an indelible mark on its territory. It is now a pleasant place to visit both for the seafront and for the old town which contains several sites of historic interest, an of course for its proximity to a good number of beaches, both sandy and rocky. The beaches offer a wide range of activities and the seafront area is ideal for your evening promenade! Leaving the beaches behind for a while, most visits to Mazara will start with a stroll around the harbour, followed by an exploration of the attractive streets, winding alleys and courtyards of the old town. The town still has a traditional Arab town plan with an old town divided into several districts (e.g. the "Casbah" and "Bath") that were once within the protection of the ancient city walls as built by Roger I (these walls lasted until the 19th century). The Casbah still has a distinctive Moorish flavour with houses decorated with pretty tiles and other decorations. This part of town still has a large Tunisian population keeping alive the traditional scents and flavours of the old Casbah. Couscous is a common dish on restaurant menus and its aromatic scent is perfumes the air. 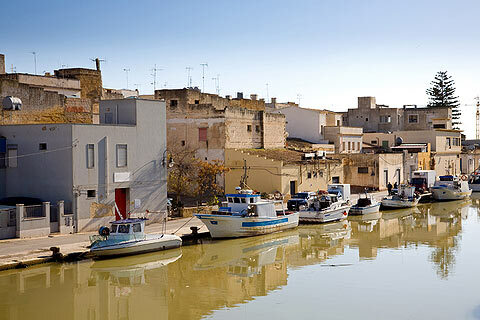 Mazara del Vallo is one of the closest towns to Africa accounting for this cultural diversity. The Normans conquered the Arabs in the 11th century and further enriched the town with the building of churches and monasteries and also a castle. Of the ancient castle dating from 1097 there are now only a few ruins, including a door with two pointed arches, a typical example of the so-called ogival style that characterized Sicilian architecture in the Norman period. The municipal coat of arms of Mazara still features the walls and castle built by King Roger I. 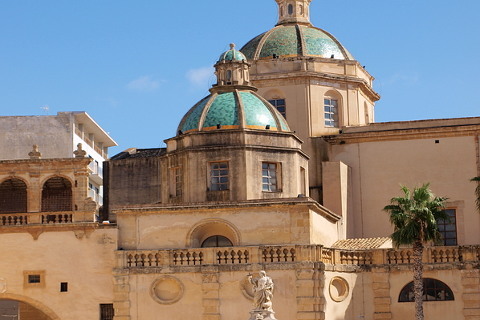 The cathedral of Mazara and the main square where it is located, the Piazza della Republica are highlights of a visit to Mazara del Vallo. Only a few traces remain of the original Norman Cathedral of Mazara del Vallo, dedicated to the "Holy Saviour” and built towards the end of the 11th century, because in the late 17th century it was completely rebuilt in a different style. The cathedral is built in an attractive mix of Baroque, Romanesque and Greek architecture. It contains several important monuments including the famous sarcophagi, a fresco with the Christ "Pantocrator" dating back to 1200 on the east wall of the transept, and a painted cross and a few works by the most prestigious members of the Gagini family. The first is an "Amazonomachy", that is a battle between Greeks and Amazons that probably took place under the walls of Troy. The work consists of various vividly dramatic and frantic scenes, with warriors, amazons and horses. The work is probably from the 2nd century AD, and a copy of a Hellenistic original. A second sarcophagus depicts the abduction of Kore and the breathless quest by Great Mother Demetra; it seems to go back to the early third century AD. The third sarchophagus is called the "Sarcofago di Canzio Marciano" and represents a scene of wild boar hunting. According to critics the static nature of the figures tells us the work was performed by minor artists, perhaps in the 4th century AD. The Greek inscription refers to the name of the deceased, “Marchionòs” (Marciano), a rather common name in the early days of Christianity. In 1999 a new sarchophagus was discovered in the Cappella dell’Incoronata in Mazara del Vallo which is decorated with scenes from the myth of Endymion. The Church of San Nicolò Lo Regale is a good example of Arab-Norman architecture in Mazara, whose foundation probably goes back to the 12th century. Inside some mosaics have been discovered from the early Christian period probably laid on a floor from the Roman age. Built on the ruins of a villa dating from the 3rd to the 5th centuries AD, it was then rebuilt in the baroque period, but it has preserved its original appearance composed of a series of blind arches to close the three pointed windows on each side of the structure. Another Norman church is the Church of the Madonna dell’Alto, called "Giummare" and dating from the Byzantine era. It has a single nave, and the church is punctuated at regular intervals by three large arches with the roof vaults. This church is also known as "Santa Maria delle 'Giummare'" for a type of dwarf palm, called 'Giummara', which grows in the area. Towards the 16th century and until the beginning of the 18th the city gained various buildings in the Baroque style such as the Church of Saint Catherine, located behind the apse of the Cathedral. Built in the 14th century it was restored in the 17th century with a richly decorated and typical Baroque style including grotesques. Inside there are some frescoes by Giuseppe Testa (18th century) and Antonello Gagini (1524). 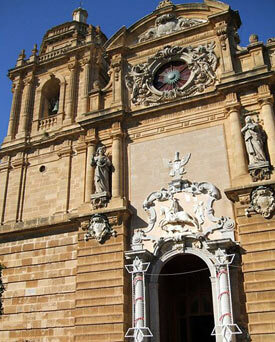 The Church of Santa Veneranda is another typical example of Sicilian Baroque style, with two lodges, a pagoda roof, and a portal in Rococo style. The interior has a centric plan, and a fine plaster decoration. Another example is the Baroque Church of S. Michael, a remake of an old Norman church that was founded by Roger II, with a Latin cross form, a single nave and small chapels. The decoration is by Tommaso Sciacca (1734-1795) and includes numerous paintings on the altars and on the vault, and a fresco depicting the "Triumph of St. Michael and Bartholomew Sanseverino". See also the Church of San Francesco which was built in the late 18th century. The portal is by Leonardo lncrivaglia, and is adorned with a marble medallion depicting St. Francis receiving the stigmata. The interior has a nave and it is decorated with frescoes and stuccos. 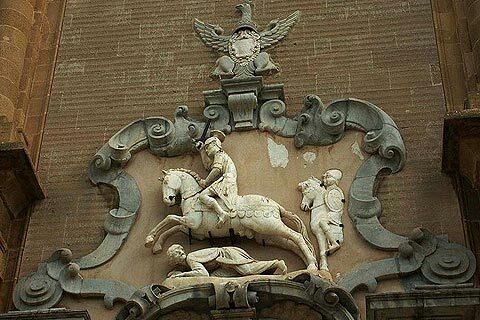 After exploring the churches in Mazara-del-Vallo you can visit the so-called "Museum of the Dancing Satyr" whose centerpiece is the statue of the "Dancing Satyr", fished out of the sea in 1997 in the Strait of Sicily. This is an example of a Greek bronze statue dating from the late Hellenistic or early Empire period, and is about two meters high. Because of its size the "Dancing Satyr" was probably not part of a group of satyrs, but was alone - and perhaps later chained astern on a Roman warship. It was often the case that statues of mythological character were carried astern of Roman warships to serve as "protectors" of the ship. The “Dancing Satyr” is curved on the right side, with the arms extended forward and is captured in the moment of making a jump on the tip of his right foot while lifting his left leg. Mazara del Vollo offers tourists who love the sea several stretches of rocky coastline with beaches of fine sand, and also a nature reserve with typical Mediterranean vegetation. Other beaches close by are ideal for scuba diving. Local cuisine includes couscous, a culinary heritage of the Arabs of the Middle Ages; fried red mullet and cuttlefish, and sea bream in broth. Mazara still boasts the largest fishing fleet in Italy. See also Mazara-del-Vallo history and etymology. Where is Mazara del Vallo? The town of Mazara del Vallo is located at the mouth of the Mazaro River in south-west Sicily, to the south-west of Marsala and south of Trapani. Marsala is of course famous for its wine but also has an interesting historic centre. Menfi has some good beaches and a pleasant town centre.